I wasn’t aware that a text message I was reading is a song. At first I thought that it was just another boring quotation on love. However, when a friend told me that it was his favorite song, I immediately looked for it in the internet. I found out that it is another amazing Filipino Song. I’m very particular when it comes to music. I have a discriminating taste that made me like Filipino Bands less. However, this one made an impact. It did not only catch my attention by its lyrics, the tune and harmony also made it unique and appealing! 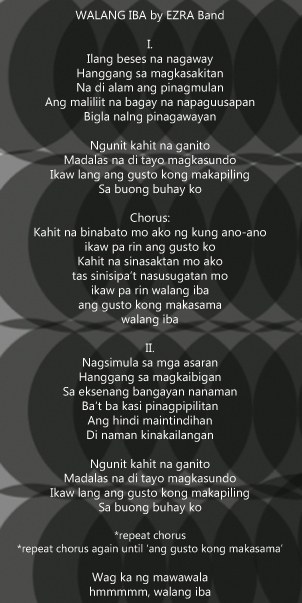 Posted on February 26, 2012, in CULTURE, Lifestyle, Music, Philippines/Filipino, Uncategorized and tagged Band, EZRA, Song, Tagalog, Walang Iba. Bookmark the permalink. Leave a comment.